In the middle of the 21st century, the United Nations enforced a renewal of the former Kyôto protocol to counter the unstoppable global warming and severely cut each countries CO2 emission shares. Due to that crisis the international stock-market changed it’s currency to carbon and thus changed the world’s order. At the same time the 2nd Great Kantô Earthquake occurred and threw the countries capital into a crisis. This saw the birth of the Atlas Project. The whole country was turned into a toxic forest, harmful for human life, used to turn the CO2 emission around and the flying city Atlas was launched. But Atlas only saw room for 3.5 million residents and social hierarchy dictated who was left within the forest, leaving a lottery as the only chance for the ordinary people to survive. Enraged by this a rebel-organization was born, fighting for survival in the forest and against the unfair treatment by the rulers of Atlas. The leader of that organization called Metal Age, Hôjô Kuniko rises up and plans to destroy the terrible order of rich and poor, dictated by the Atlas rank. As there should be some people around here who have some interest in Anime as well, there is a chance that you know this plot from the novels anime adaption in 2009. It was one of Gonzo’s last project’s before they almost suffered total bankruptcy and I understand when rumours claim that projects like this were part of the reason. To turn this novel, which has a total of 592 two-column pages, into a 26 episode anime was an eager and almost impossible project. I still think the anime did fairly well, but they only got half of the book covered when they had to start advancing towards the climax. So many parts of the plot were ditched entirely, leading also to an anime original ending which featured a totally different antagonist, different motives and different resolutions. They still delivered the same overall message, but some plot twists came a little bit forced as they weren’t foreshadowed in the slightest during the anime’s first half, which was still rather faithful to the novel. But let’s focus on the novel itself. This is one of the few science fiction epics I actually enjoyed reading. I personally never made it through the Dune saga and I admit that this novel has some similar problems, especially when it comes to explanations regarding the CO2 and carbon-system, but somehow the fantastic elements of the plot really did it for me. So we have this futuristic setting, which might not be so far off after all, as it features problems which are actually discussed in modern society. 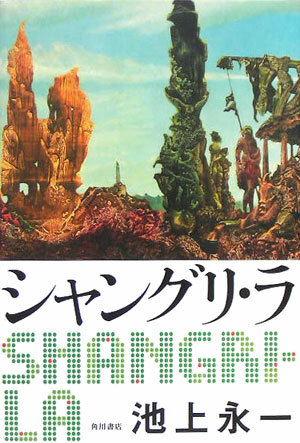 Global warming, the rising fear of big earthquakes in urban areas of Japan, stock-market crashes; the world of Shangri La is by far not as futuristic as one might expect when reading a science fiction novel. The only thing that really belong into that category is the existence of virtual reality and the appearance of the flying city of Atlas. Why only the appearance of it? Well that falls into the reason why I liked Shangri La, it’s use of Japanese mysticism. The appearance of the spirit of Hiruko as the insane CEO of Atlas is not the only fantastic element of the plot (though sadly one of the only elements which made it into the adaption) and when the search for the three holy items starts, the plot really kicks in. That is another element that made the novel a very good read, it made excellent use of it’s characters. They really delivered the different opinions concerning the crisis and Kuniko and Mikuni came around as surprisingly mature, especially if you’ve seen the adaption before, like I did. Okay, the background of the final antagonist is a little bit cliché and comes off like a typical science fiction bad guy. I would have liked a little more personal reasons and less mysticism paired with political issues at this point of the story, but the finale was still delivered pretty well and I liked it for being pretty tense and by far not as sappy and tear jerking as I expected it to become. I know this novel is a little different from what I normally read, but I can still recommend it to everyone who is open about trying something new. The novel doesn’t try anything particularly new, but it is pretty interesting how mysticism and current events are woven together in one science fiction setting. It also used many things that I would consider typical for recent novels, especially using emblematic reminiscent of popular culture, and it was interesting to actually see that Mystery Fiction is not the only fantastic genre that is heavily influenced by those.